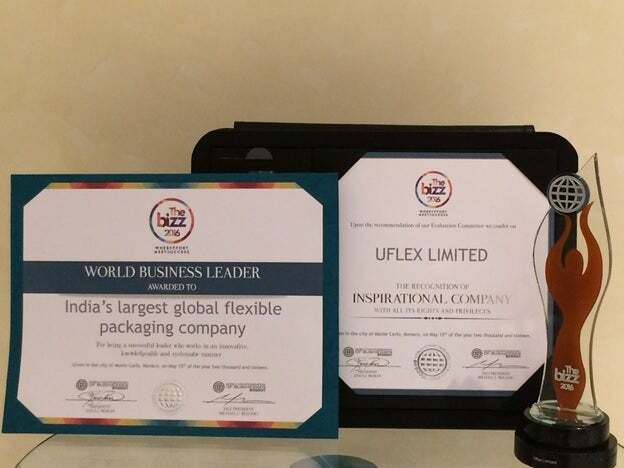 India’s largest global flexible packaging solution company Uflex Limited is the recipient of the prestigious ‘The Bizz 2016’ award by World Confederation of Businesses (WORLDCOB). Uflex was selected for this coveted title by WORLDCOB owing to superior rankings in vital parameters such as Managerial Leadership; Management Systems; Quality of Goods & Services; Innovation; Social Responsibility; Business Results, Certifications, Recognitions and Presence in Mainstream and Social Media. Leading global corporate houses were assessed by market research agencies like KOMPASS and ZAWYA and data related to their business growth and operational excellence was compiled and examined. The Jury comprising multidisciplinary professionals from various countries also factored in the data that was solicited from more than 150 chambers of commerce around the world. Some of the global public relations companies of repute also provided references through their media and network resources to the Confederation that further aided in firming up the list of winners. WORLDCOB is a member of US Chamber of Commerce, United Nations Global Compact and Global Reporting Initiative and its membership in turn pans across 3000 companies in over 120 countries. The award ceremony that took place in Monte Carlo, France on Sunday witnessed avid participation from business heads of several global organizations that have been making headlines for their unmatched products and services. Also in attendance at the event were Ambassadors of several countries to the French Republic. In an official statement issued soon after the conferral, Mr Ashok Chaturvedi, Chairman and Managing Director, Uflex Limited said: "This award by World Confederation of Businesses is a testament to Uflex’s meticulous approach in ensuring product and operational excellence. We owe it all to our clients who pose unwavering faith in our capabilities to offer complete spectrum of flexible packaging solutions etched across BOPP, BOPET, CPP, Metallized & Speciality films; Value added packaging products likes laminates, pouches, bags, flexi-tubes; Rotogravure printing cylinders; Flexo-polymer plates; Packaging & Converting machines; Inks & Adhesives and foolproof Brand Protection & Anti-Counterfeiting solutions. "I am inspired by the fact that our bespoke packaging solutions have been acknowledged in India and overseas alike. We will continue to delight our clients through innovation and create value added differentiation by putting the cutting-edge technology to best use."